The green game - in it to win it. Just a little look at my nails from last week. I've been switching up my accent nails and doing the index and ring finger on one hand and the thumb and ring finger on the other. I think its a good balance of funkiness without it looking like it does not match, because that ish doesn't fly around here. 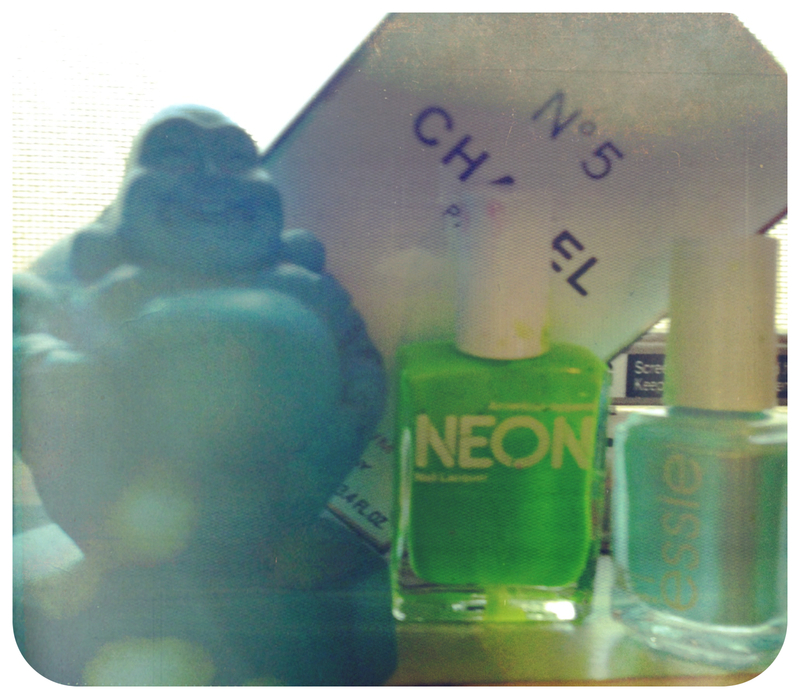 I used mint candy apple by Essie and Neon Green from the American Apparel nail color line. I love the way the two green-ish colors looked together. The mint candy apple is almost like a light turquoise with a touch more green than blue and the neon green is just super bright and a totally unnatural shade of green, but I thought it went great! Love pastels and neon together. What do you think? wow i want thiss nail art on my nails :), how frsh :) just right summer suff. That's what I though too! great summer look! I will check out your new post tmrw, on my way in to work now. I can't wait to check out your new post. I need o try this on my own nails! I plan on posting a tutorial soon. I feel like its all happening so fast, life I mean. Although they say if your dreams don't scare you, they aren't big enough. wow i love those colors! Un saludo y encantada de leerte!! perhaps you'd like to follow each other. I always love follow blogs where people put theyr OWN pictures, i guess, that just make it look more interesting and better. I totally agree, I love to look at people's personal photos. shots from magazines or editorials. I followed you as well. These nails aare so perfect ! Great nails! I'm following you back on Facebook with profile name: Evi Fashionholic! I follow you on both too! And thank you for your nice comment on my blog - I checked immediately your blog with the result: I like it! I would like to follow you on gfc and/or bloglovin. It´ll be great if you come return to my blog to follow me – then I will follow you immediately back. Aw, you are too sweet. I'm following you back on both. Would you like to follow each other, dear? If you want let me know! Thanks, I thought so too! Your nails looks great. Mint is style this season:) I am following GFC and Bloglovin' Follow back? Follow you on instagram, give me your Fb page also? Sure thanks so much, doll! Have you tried this? Is it good? so cute >.< love the green color!! Do stay in touch dear ! Love this-- especially the fact that you didn't just accent your ring finger! When I first saw it I thought it was a decal. Really impressive!